Ahead is the US 31 bridge over the Ohio River into Jeffersonville IN. To the right on Main was the historic beginning of US 42 after 1932. From there (per 1950s USGS topos), US 42 continued west on Breckinridge Street, then south again on 3rd Street, all the way to the University of Louisville campus. The route ended at Eastern Parkway, where it junctioned US 60 Alternate. Not far north of there, northbound traffic shifts one block to the east, on 2nd, and from there, US 42 continued by turning right (east) on Kentucky Street. 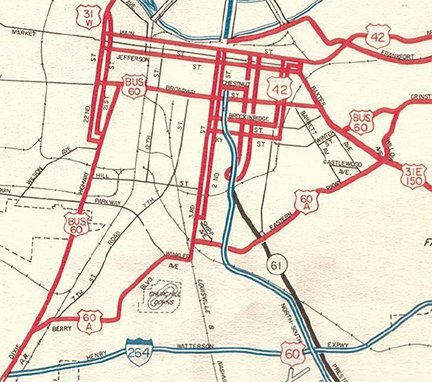 Sometime in the 1960s (again according to USGS maps), US 42 was removed from the 2nd/3rd couplet, so Kentucky at 2nd became the west beginning of US 42, and Breckinridge at 3rd became the west end. last updated Dec. 29, 2018.